Departments get crafty to create faster, more efficient methods to search medical records. Ever-evolving technologies seen in and outside of the HIM department may help solve problems, but at the same time, present a new set of challenges. When resources to address health information hurdles are in short supply, some departments are choosing to up their ingenuity and solve such puzzles from within. Both The Children's Hospital of Philadelphia (CHOP) and the University of Michigan Health System are examples of the success that comes from personnel who use their expertise and enthusiasm to design technologies that increase department efficiency while ensuring patient information stays safe. Stephen Young, MD, CHOP's interim HIM director and its release of information and clinical data access manager, led a team that devised a method to scan medical records for key words to help prevent the release of sensitive patient information. The solution's genesis stemmed from an increase in EMR documentation, which made it more difficult to complete record requests in a timely and secure manner. "The impact is a greater volume of output produced in response to requests for records," Young says. "Ultimately, this created an ever-increasing challenge to perform quality reviews for sensitive information while meeting regulated turnaround times for requests. Due to the size and expansion of our organization, we receive a very high number—approximately 1,200—of requests monthly." The tool pinpoints and flags potentially sensitive words and phrases in the record that can be hard to catch for even well-trained HIM staff. "Even with extensive training, we are not clinicians or pharmacists," Young points out. The technology not only helps department staff abide by federal and state privacy laws, but also aims to protect patients. "We want to act in the best interest of our patients and families and protect their privacy to maintain a relationship to better their overall health and well-being," says Young, who notes that being a specialty hospital adds another layer of complexity. "Because we are a pediatric facility, we face the additional challenges surrounding adolescent health and privacy. This tool also allows us to decrease our request processing turnaround time to better serve our customers' needs." Requests are entered into a queue for review and processing. Next, staff members consolidate all appropriate and relevant information within the EMR into a single electronic document. From there, the document is reviewed for any information that directly or indirectly identifies sensitive information. Depending on the findings, additional action is taken as necessary. Whether that action is a physician's review or a record denial, Young says patients' privacy and well-being are always top of mind. In addition to safeguarding patients, the tool has also proven to be a time-saver. For example, according to Young, a 200-page output that previously would take more than 20 minutes for HIM staff to review can now be scanned in a couple of minutes. Because every record and request is different, Young acknowledges there's always the potential to leak sensitive data. To help safeguard against the release of inappropriate information, the list of key terms is reviewed and updated as necessary. Also, staff members are instructed to use the tool only as a guide, relying on the human eye to make the final call. Redaction is also part of the process, depending on the requester. "Certain types of information may need to be redacted for a third-party requester, but not if requested by the patient," Young says. "Once we understand the context of the record, we can select certain words or phrases to have redaction applied, or we can reprocess the chart and omit certain visits or notes." While the solution has been a huge win for HIM staff, it's important to note that the implementation process had its fair share of hurdles. Because the organization had already lined up previous projects to support other goals, resource allocation was a problem. For some, that might've been the end of the discussion, but a persistent Young found a way to make it happen. "I researched the capability of our existing software applications' tools and learned how to create searchable, importable flat files, along with writing hot key scripts to automate the process," he says, noting that it was a lot of trial and error, some done during off hours. "It may not be the most robust or fancy tool, but it meets our needs and did not require any additional costs to the department." And it's not just CHOP that can benefit from the tool. Young says any HIM department whose system produces medical records in the form of a PDF can take advantage of the concept. "We use a PDF viewer to search for a predefined set of terms," he explains. Young suggests interested organizations start by creating a single column spread sheet of searchable terms. "I recommend tailoring this to your organization because the bigger the list, the longer the search times," he says. Save the list as a flat file—such as a .txt document—to a location shared by staff who will utilize the tool. "When you open your output in a PDF viewer, use the search multiple words command and import the file," Young says. "Depending on your vendor, this step may vary. This will produce a list of all the terms that match, how many times, and where they are in the chart." The University of Michigan Health System has bathed its HIM department in EMERSE, a technology similar to Google in that it allows staff to conduct free text medical record searches. According to David Hanauer, MD, MS, the health system's associate chief medical information officer, EMERSE started out as a research mechanism. "The original reason we developed EMERSE was to help researchers better access the data 'trapped' within the free text notes of the EHR," he explains. "Some of the most valuable and rich data are locked within these notes. Ironically, the use of electronic systems hasn't necessarily made it easier to find the information. Users need a way to search for key elements in the notes." While Hanauer gives natural language processing (NLP) much credit for its potential to mine data, he says the technology is nevertheless difficult to implement and customize. "In my experience, a key difference is that NLP is better suited for a single task for which it has been highly customized/tuned by NLP experts, whereas EMERSE is better for a wide range of tasks by users who do not require any technical knowledge," Hanauer says. Conversely, technologies similar to Google and EMERSE are more familiar to users, in theory making them easier to use. "We developed the tool for researchers but then opened it up to others in the health system," Hanauer says. "It turns out that HIM had a huge unmet need for such a tool in their everyday work." It certainly did, says Laura Shue, MPA, CHDA, director of health data quality and compliance. 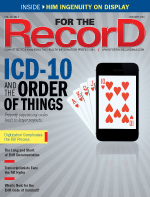 "In the paper world, HIM professionals often had to search volumes of paper when conducting our Joint Commission audits, or coding or quality reviews while maintaining patient identity and data integrity," she says. "When we adopted an EMR, we struggled to maintain or realize promised efficiencies. EMERSE quickly helped us close that gap by helping us locate specific words or conditions within the vast space of free-text entries in the EMR." Hanauer says EMERSE helps with the "needle in the haystack" problem. "That is, it leverages fast computers to index every word in every clinical note and allows users to search through those notes rapidly and highlight every word or phrase being searched," he says. 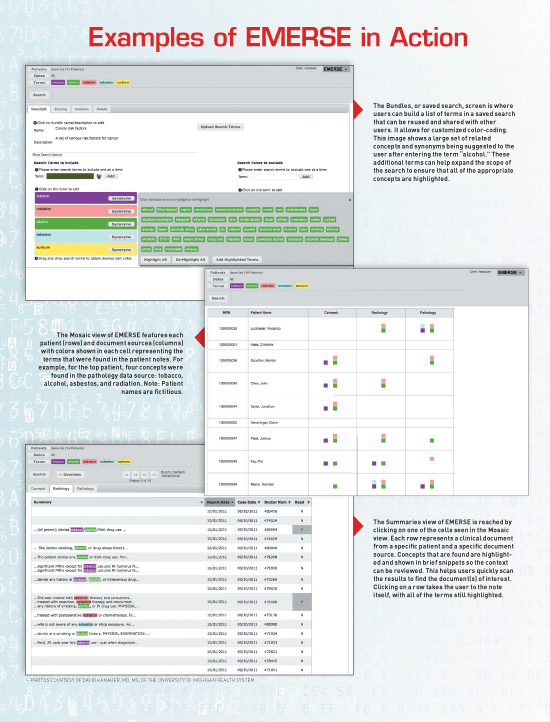 At its core, EMERSE is an information retrieval system that allows users to limit a search to a known set of patients, which helps with several HIM workflows. "We currently have nearly 100 million indexed notes in the system, so without a tool like EMERSE, it would be almost impossible to keep up with that volume without drastically increasing staffing," Hanauer says. The technology also possesses what Hanauer calls built-in "smarts" that can aid HIM staff searches. "For example, it has thousands of synonyms and acronym expansions built into the system, which are suggested to users to expand their search," he says. "It also allows users to make some searches case sensitive, which helps, for example, in distinguishing the common word 'all' from the cancer 'ALL' [acute lymphoblastic leukemia]." EMERSE fits neatly into HIM's workflow, Hanauer says. "We get a real-time feed from our EMR of new documents. Each night, we add those documents to the index. When a user logs in, he or she can enter a set of medical record numbers or a date range to limit the search, and then they enter keywords and phrases," he explains. "The system then retrieves those documents, highlights all key terms and phrases, and presents them to the user in an easy-to-read format that makes sense for people who are used to reviewing medical record data." Shue says EMERSE is embedded in the daily coding workflow to assist with clinical documentation improvement efforts. For example, coders use the tool to search for common conditions such as congestive heart failure and diabetes that contribute to risk of mortality and/or severity of illness scores. They also can use EMERSE to quickly find the first mention of a condition or a bundle of symptoms related to a certain condition. According to Shue, the time saved by using the technology has helped maximize staff efficiency, a necessity in the coding world. "With coding staff under high demand, minimizing the time they spend searching through the record helps maximize the time they can spend actually coding the record," she says. But it's not just coding reaping EMERSE's benefits. Now that the staff is accustomed to the technology, Shue says it's also being leveraged for Joint Commission audits and data integrity purposes. "For Joint Commission audits, we appreciate the ability to import patient lists into EMERSE and conduct a mass search of specific bundled terms," she says. "For example, the use of scribes is a hot issue with the Joint Commission right now. We use EMERSE to audit charts we know a scribe has touched to ensure adherence to our scribe policy. The keywords of our required scribe attestation are already bundled into EMERSE, so it's a simple matter of importing the patient lists and running the prebundled search terms." Hanauer says regular communication with the compliance department includes ongoing discussions of who should or should not be given access to EMERSE. "In general, those who have access to the medical record can have access to EMERSE, since EMERSE is essentially a way to view the medical record data," he says, adding that detailed audit trails are maintained. Hanauer also points out that EMERSE can actually reduce the amount of protected health information being viewed. "The standard approach for document review is for someone to read through every document to find the information of interest. With a search engine, users only need to review the documents with the desired terms, meaning that they not only save time, but also avoid looking through many documents with protected health information that are not relevant to the search," he says. The use of abbreviations, a point of emphasis in Joint Commission audits, is also addressed. "We have saved all of the Joint Commission-unapproved abbreviations into a search bundle," Shue says. "On a monthly basis, we run a sample of patient medical record numbers through EMERSE to check for usage of these unapproved abbreviations. EMERSE is sophisticated enough that we can program in 'rule out' or 'ignore' parameters within the search bundles." Take the use of "U," which is unapproved by The Joint Commission but used frequently at the University of Michigan Health System (U of M). "We have programmed the bundle to ignore 'U' when followed by 'of M,'" Shue says. Such "negation handling" helps eliminate false-positives, which can be reduced by case-sensitive searching. "We also provide a very simple form of negation handling where users can enter a list of phrases in which they want to ignore the context of a term," Hanauer says. "For example, for ophthalmology, we developed a set of search terms to find postsurgical complications. We search for just one word—'complications'—and ignore about 50 phrases in which that word appears in the wrong context—'no complications,' 'diabetes with neurological complications,' etc." • Involve compliance early and often. • Include multiple users beyond HIM's walls. • Seek input from clinicians and researchers. As with any process change, always underpromise and overdeliver, Hanauer says. "Unfortunately, NLP has generally fallen into the category [of overpromising and underdelivering]," he says. "Thus, we do not promise fully automated text extraction processes. Rather, we promise a very easy-to-use system that helps users get their job done quickly, but not fully automatically. Consider EMERSE to be a good bridge system until fully automated, fully reliable, and scalable NLP becomes a reality." For health care organizations interested in taking EMERSE for a test drive, Hanauer says the University of Michigan Health System is currently offering the technology free for academic use and at minimal cost for nonacademic use. Despite working with less-than-ideal resources, both CHOP and the University of Michigan Health System ignored any shortcomings to create unique solutions, proving innovation, problem solving, and persistence can be steppingstones to a more efficient HIM department.